Three factors combined to make the last home run of Joaquin Andujar’s career both special and unconventional: It was a grand slam, he called the shot and the Cardinals pitcher, a right-hander, hit it left-handed. On May 15, 1984, Andujar earned a win with a complete-game eight-hitter and slugged the fifth and final home run of his big-league career in the Cardinals’ 9-1 triumph over the Braves at St. Louis. In the eighth inning, the Cardinals led, 5-1, and had Andy Van Slyke on third and Ozzie Smith on second with two outs and catcher Tom Nieto at bat. The Braves opted to walk Nieto intentionally, loading the bases. As reliever Jeff Dedmon delivered the mandatory four pitches outside the strike zone to Nieto, Andujar, waiting at the on-deck circle, pointed to the right-field wall. “I told (teammates) George (Hendrick) and Tito (Landrum) that I was going to hit a home run,” Andujar told The Sporting News. Smith, watching from second base, confirmed to St. Louis reporter Rick Hummel that he saw Andujar call his shot. “Can you believe that?” an exasperated Smith asked. Leaving the on-deck circle, Andujar strode toward the plate and settled into the left side of the batter’s box. His first four major-league home runs had been hit right-handed. Andujar hit three homers _ off Bill Lee of the Expos, Steve Rogers of the Expos and Rick Wise of the Padres _ with the Astros. 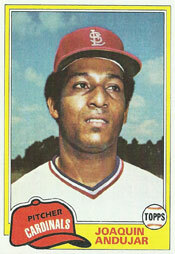 The fourth was hit for the Cardinals, again off the Expos’ Rogers, on April 27, 1984, at Montreal. A career .127 hitter in his 13 major-league seasons, Andujar used a personal formula to determine whether he would bat right-handed or left-handed. He usually opted for the left side when facing a right-hander he didn’t know or when runners were on base, Hummel reported. Dedmon, a right-hander, never had faced Andujar. With the bases loaded, “I knew they’d have to pitch to me,” Andujar told the Associated Press. Andujar dug in and waited for a pitch in the strike zone. “It was right down the middle,” said Braves manager Joe Torre. I was actually at this game. I was seven years old. On the way home, we found a turtle near the road. We put him in a box and I named him Joachim Andujar, probably the craziest turtle name ever. What a great night. Scott: Great story. That was one tough, cool turtle. Thanks for reading and for sharing the remembrance. I have looked almost everywhere for a video highlight. Can anyone direct me to a link?